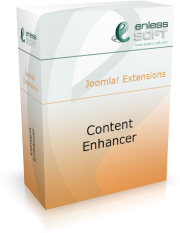 We would like to announce that Content Enhancer can now be used with Joomla 1.6 and 1.7! The new version of Content Enhancer is 1.7, reflecting the Joomla version. Partial update. Please note, that this is a partial update of the product. Not all features of the 1.5 version are available in the new versions. The module enhancement feature is not supported yet. We are planning to release it in the near future. The main functionality of the product was updated and is working in Joomla 1.7. Who can get the new version? As always, all of our customers who purchased previous version of the product, can download the new versions for free. How to get it? If you are an existing customer, just log in to your account and head to the download section of Content Enhancer. You will find all installation packages there. If you are a new customer, proceed to the online purchase page. What has been changed? Adjustments were made in order to be compatible with the changed architecture of Joomla.